Thank you for your interest in The Springs hotel and Spa. Our resort is the perfect location for your Arkansas getaway whether you are looking for a place for your business conference a romantic getaway or simply a relaxing weekend in our spa. 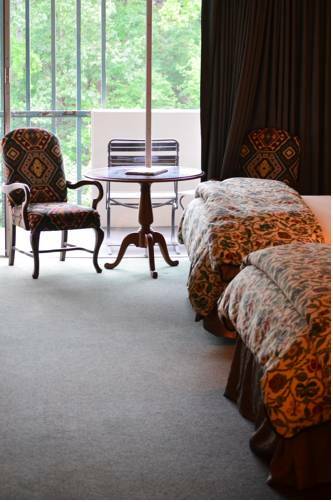 Our historic resort is nestled between the Quachita Mountains in the heart of the Downtown Historic District of hot Springs National Park Arkansas. We are located three blocks north of famous Bathhouse Row within walking distance of over 80 shops restaurants and attractions and only six blocks from Summit Arena and the Convention Center. We are within minutes of all the major attractions in Hot Springs. A paradise for relaxation our hotel features a Bathhouse Spa which provides Hot Springs thermal baths and massages. We are one of only four locations which have the Hot Springs National Park mineral water in our bathhouse. We invite you to come for a relaxing soak in a world famous Hot Springs thermal bath in our spa. Other amenities include an outdoor heated pool a beauty salon two dress shops and a restaurant that offers buffet or menu and room service. Our crown room is perfect for your catered banquets or conference meetings. Relax in our beautiful lobby and enjoy free live entertainment on Friday and Saturday evenings. We offer standard rooms with two double beds and or one king size bed and executive luxury and two room suites. All our rooms have balconies with views of either the Historic downtown district or the forest behind our hotel and free wireless internet. Bruno s at The Springs: General Hours Morning lunch and Dinner. Our resort is the perfect location for your Arkansas getaway whether you are looking for a place for your business conference a romantic getaway or simply a relaxing weekend in our spa. Our historic resort is nestled between the Quachita Mountains in the heart of the Downtown Historic District of hot Springs National Park Arkansas. Garvan Woodland GardensA beautiful garden that changes by the season. Magic Springs Amusement Park and Crystal FallsAmusement and water park. Mid America Science MuseumScience Museum.